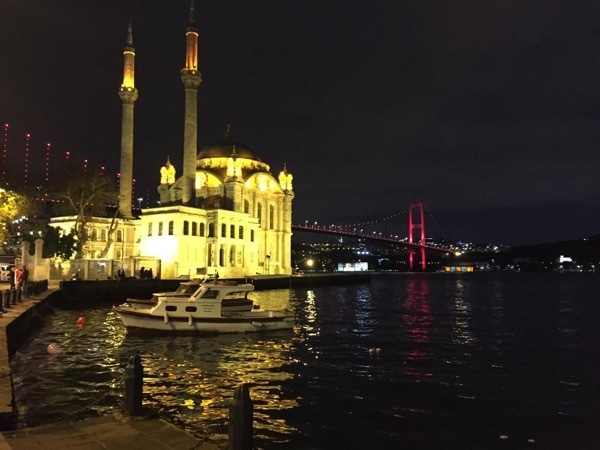 Traveler Reviews for Private Tour in Istanbul, Turkey by Tour Guide Safiye K.
Safiye was such a great guide! She was so easy to get along with and made our day in Istanbul so much fun. She knew a lot about the history and culture, and she had great recommendations for things to see and do. It was tulip season, so she took us to the gardens with the best views. We walked through Topkapi Palace, the Spice Bazaar, a beautiful mosque and Grand Bazaar. We would have gotten so lost without Safiye. I would definitely recommend a tour with Safiye. At the end, you feel like a close friend. We had the best half day tour with Safiye, walking around the streets of Istanbul exploring the historical sights. Safiye is a wonderful person and really nice to hang out with, chatting about life in Istanbul and Turkey and of course the historical facts. We highly recommend a guided tour like this with Safiye, to get the most out of your stay. She is indeed helpful and service minded. Safyie was knowledgeable and flexible, for me two essential qualities for a guide. Communication with her before the tour was generally good and the tour reflected pretty much what we had initially agreed upon. Safiye was an excellent guide! We had several hours to see Istanbul on an airport layover. We were able to see the major sights and do some shopping in this time. She helped us to understand and appreciate Istanbul. She knew all the history of Istanbul and she was able to answer all of our questions. Highly recommend! Safiye responded quickly to every email while we were planning our trip and met us at our hotel on time. It soon felt like an old friend was guiding us around the city as we learned and laughed together. She knew her history well but interspersed other fun observations as we zipped through the highlights of Old Istanbul. I was amazed at how much we were able to see in our 4 hours together. She perfectly tailored our time to exactly what we wanted to see and do. I would highly recommend Safiye. Safiye is a wonderful guide! She is super professional, friendly and reliable. When we met up, she gave us great advice on how to pick a hotel and got us from the airport to the old city in no time! Then we went for dinner at a great rooftop restaurant and walked through the streets of Istanbul. Our tour started a bit late because of lineups at the airport so she gave us 30 minutes of her time extra at the end of the tour. She is very knowledgable and taught us a lot about Istanbul's history. Safiye was amazing!! She was super nice to us and very knowledgeable. She is super kind and answe all the question we had. She was ver understandable and flexible as I travelled with my parents (elder and limited mobility). Thanks so much Safiye!! You were amazing!! TOUR GUIDE RESPONSE: Dear Hector, Thank you very much for your lovely comment, it was a pleasure to be your guide. Hope to see you in Istanbul again. Wonderful guide , super funny . You won't regret. Worth every penny. The BEST. So knowledgeable and fun. Did two separate days with Safiye.. all was at my pace with all other fun details taken care of by her. Safiye was an excellent guide- not only was she very knowledgeable of the history and where to go, but she was also great company. I would absolutely recommend her to anyone wanting to experience this beautiful city. A joyful half-day with Safiye exploring the Blue Mosque, the Suleymaniye Mosque and tombs, local markets of Eminoglu, and the Spice Market. I benefited so much from Safiye's vast knowledge on everything from tenets of Islam to the long queue in front of the most popular coffee place to green raw henna and dried eggplants for sale in the market. We were taking taxis on this day, and her sociability gave me added insights when she relayed her lively conversations with the drivers. Safiye is a wonderful guide! She was so very friendly and easy going, she was fantastic with our daughter as well. She is very knowledgeable about the history of Istanbul and kept the tour fun and exciting. Our 4 hours went by so fast and we truly got to experience the best of Istanbul in a short time. If you are looking for the best guide in Istanbul book with Safiye! 5 out of 5 (can you make it 10?) Safiye is awesome! She met me much earlier than her normal availability, provided detailed information about the sights, and was just fun to hang out with. This was a layover tour, so can't wait to come back for something more in-depth with her! I only had time for a short tour during my layover. Safiye fit in as much as possible while getting me back in plenty of time for my flight. So I got a look around the Old City- Hagia Sophia, Blue Mosque, Grand Bazaar. I had a wonderful time and would love to return. Highly recommend. Safiye Thank you for a wonderful day. We enjoyed it very much. Safiye is very knowledgeable about the history of her city . Thanks again. Safiye was a delightful guide, but we would have liked more in-depth information about the sights we visited. However, in fairness to Safiye, we did not communicate this at the time. She was very courteous and a good communicator. TOUR GUIDE RESPONSE: Dear Shannon, Thanks for your kind review, I had great time with you and it was pleasure to meeting you. I will ask in the future if customers want more in depth information, everyone prefers a different style. Our half day with Safiye was perfect! Because we had been with her the previous day, she was able to continue to build on what we had seen the previous day. She kept the pace moving, to suit our needs. We were not into much shopping, she she provided us the feel of local shopping without belaboring it. We learned much about Istanbul's and Turkish history as well as present day life. She was pleasant and well informed. I would highly recommend her! excellent in every way,intelligent,knowledgeable, punctual,very kind,and interesting and fun to be with. excellent in every way, intelligent,knowledgeable,interesting, punctual ,easy to listen to,very kind and fun to be with. I had a wonderful day in Istanbul with Safiye. I went to places I had never visited before which was what exactly what I wanted. I traveled on a tram, ferry, funicular and a local bus, it was a wonderful way to mingle with the local people. Safiye was very knowledgeable about her city and she was able to answer all of my questions about the history and current situation in Istanbul and Turkey. Safiye is a lovely young woman who exudes enthusiasm, it was a delight to spend the day with her. We were traveling with another family and had 5 children under the age of 9. It was important for us to have a guide that was able to explain the history and culture of Istanbul in a way that was interesting for both the children and the adults. Safiye was simply fabulous!! She is friendly and warm, very knowledgeable and a great story teller who kept the children (and adults) engaged, she was flexible and was able to tailor the itinerary to suit our group. I have no hesitation in recommending Safiye. We used Safiye for 2 tours in Istanbul and both days were filled with adventure and learning as we explored Istanbul, as well as being relaxing and enjoyable (which is not always the case in a big city). This is solely due to Safiye, her expertise and knowledge, her ability to suit the tour to the group and her friendly nature. The children loved her! I will definitely be recommending Safiye to friends visiting Istanbul. Really enjoyed Safiye (Sofia). She was a great tour guide. However, we felt like we were directed to places that she either had to take us - like the carpet manufacturer described to us as a "handicraft shop" or places where she may be getting a kickback - not necessarily where we wanted to shop. Perhaps this is the Turkish way but we felt very pressured to shop at specific places, not those of our choosing. Next time - if I ever return to Istanbul - I will be more clear and forceful. I can not put into words the great time we had. Safiye was absolutely great in every way. We were 45 min early leaving our ship, taking a chance she might come early, and she was there waiting for us. We had a wonderful afternoon touring Istanbul, it tourned out to be the highlight of our cruise. Safiye was a delightful tour guide, and I would highly recommend her to any one. What a joy to have Safiye as our guide on the first day of our visit to the Magical City of Istanbul. Not only was she a wealth of information but she was also warm, kind and loads of fun. I would highly recommend her to anyone who wishes to experience Istanbul with a local and see the city through the eyes of a Native. Safiye is a lovely person with a deep breadth of knowledge of the local lore. She had a lot of patience with us and took us to places that we would not have readily found on our own. She also had modern opinions about Turkey in general. It might be better to have more conversation about the things that are available to see, but we probably would have ended up with the same itinerary anyway! I would recommend her. Safiye was a wonderful guide. She was on time and knew all the answers to our questions about the Topkapi Palace. She was fluent in English and very personable. I would use her again without hesitation. Thanks Safiye. TOUR GUIDE RESPONSE: Dear Douglas, thanks a lot for your nice words to me. You were very interested in the Turkish culture. I tried to do my best for you. We had two half day customised tours with Safiye during our short stay in Istanbul. We are not only returning home with more knowledge and great memories, but also having made a new friend. Safiye led our small group of adults and teenagers in such a way that we all enjoyed and learned from the historical sites. She also took us to places that you would not find in any tourist guidebook which gave us a great sense of the real Istanbul. She is highly recommended by us all. Excellent guide with great English skills. Customized a tour for us and she made Istanbul a great visit. Our brief tour with Safiye was very good. 5 stars. Excellent guide all 4 days! great English. Very knowledgeable about history and sites. Very accommodating in every way. Willing to customize tour, even midway thru tour day. Safiye made navigating this complicated city simple. When many streets unexpectedly closed, she persevered in working thru it and got us back to our flat. Knowing our daughter avoids the sun, she found shade at every opportunity, and loaned her own sunscreen until we bought our own. Safiye worth every $! HIGHLY recommend Safiye! "Sophie" was so warm, engaging, and patient with our family that spanned 3 generations!! We traveled through old Istanbul at a comfortable pace and recieved outstanding commentary from her at every fantastic destination she took us. Our entire family, age 8 through 68 thoroughly enjoyed Istanbul. We hated to say goodbye to our new Turkish friend at the end of the day! !